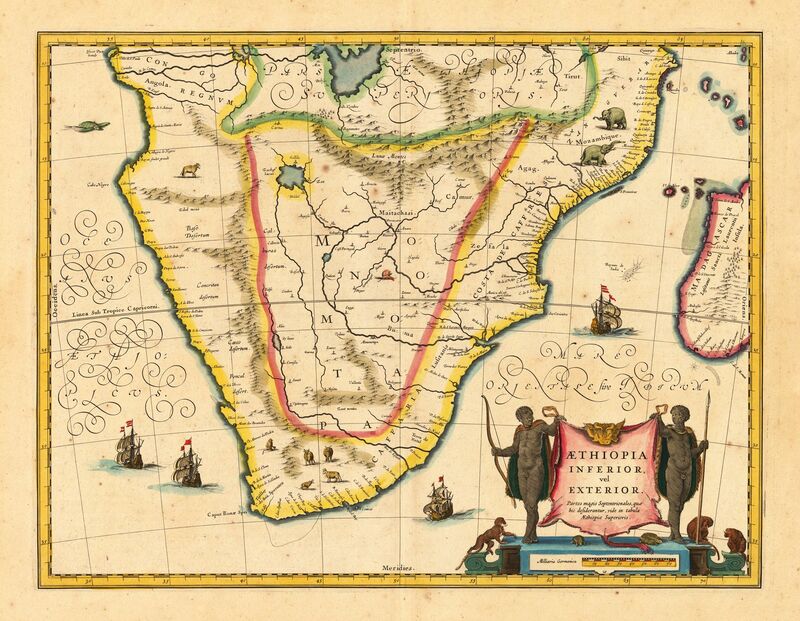 South Africa had humble beginnings as a refreshment station, founded by Jan van Riebeeck in 1652 in the Cape of Good Hope on behalf of the Dutch East India Company. The refreshment station would later grow to become Cape Town, the country’s current legislative capital. In 1806, the Cape Colony was seized by Britain, causing the great Boer migration of the 1830’s, as many wanted to escape British rule in the colony. The First Anglo-Boer War lasted from 1880 to 1881 and saw the Boer’s successfully fending off encroaching British expansion and rule through early South Africa (which had yet to be founded officially). Yet The Second Anglo-Boer War, from 1899 to 1902, saw the Boer’s defeated by an overwhelming British force and in 1909 saw the formation of the Union of South Africa, now a British domain. As a British colony, many South Africans were called up to serve under British command in World War I, 1914 to 1918, and after the German defeat, their colonies were subsequently divided amongst the victors. German South-West Africa (today Namibia) was founded in 1884, but was soon invaded and occupied by South Africa in 1915 as part of the war effort. In 1919, the German colony was officially mandated by the League of Nations (the precursor to the United Nations) to South Africa who proceeded to run it as a fifth province, despite it never officially becoming one. In 1931, the Union was officially granted independence from the United Kingdom and in 1939 the newly formed United Party, a political party formed to reconcile positions between white English and Afrikaans South Africans, split over the decision to join the UK in World War II against the Axis powers. The split saw most Afrikaners shifting their allegiance strongly towards the National Party (NP) whilst many South Africans went to fight regardless. In 1946, the League of Nations was succeeded by the United Nations who requested South Africa yield the mandate of control over South-West Africa (SWA) with the intention that the country would stay under South African stewardship, with UN supervision, for a short while longer with the eventual aim of actual independence after appropriate dialogue with and support of the local ethnic population. The Union refused and in1948 the NP came to power and with it the many legislations which gave birth to the infamous institutionalised racism known as Apartheid. The 1950’s saw the Herero Chief’s Council of Namibia petitioning the UN for Namibian independence, the 1960’s saw many European colonies in Africa being granted their own independence, which placed mounting pressure on South Africa to do likewise, and in 1966 the International Court of Justice declared South Africa’s continued occupation of SWA illegal. In the meantime, the Union of South Africa officially became a Republic in 1961 and left the UK Commonwealth. The newly formed republic found itself under immense pressure from the 60’s onwards to rescind Apartheid and install a majority government, in SA and SWA, which meant that the ethnic populations would be given due democratic rights as well as access to land etc. However, South Africa stubbornly refused, even in the face of mounting international boycotts and protests. The South-West Africa People’s Organisation (SWAPO) was founded in 1960 and in 1966 their military wing, the People’s Liberation Army of Namibia (PLAN), began armed operations against the occupying South African government, following their refusal to grant Namibian independence that same year. SWAPO had already established bases in neighbouring Zambia and began a guerilla campaign in and on the border of SWA. Local units of the South African Police (SAP) were struggling to contain the guerilla fighters and so the South African Defence Force (SADF) was called in to assist. On 26 August 1966, elements of the SAP, SADF and South African Air Force (SAAF) attacked a known PLAN training base in the settlement of Omugulugwombashe, near the northern border of Namibia. This was the first official exchange of fire between the two sides, and is considered simultaneously to be the official start of the South African Border War as well as that of the Namibian War of Independence. To this day, it is celebrated in Namibia as Hero’s Day and is recognised by the UN as Namibia Day. Attacks and skirmishes between South African and SWAPO forces began to escalate and across the border in Botswana the African National Congress’ (ANC) military wing, Umkhonto we Sizwe (MK) – The Spear of the Nation – began operations of their own against, thus ensuring the conflict remain regional. Across the northern border of Namibia, tension had been brewing in Angola where liberation movements were waging their own independence struggle against Portuguese colonial rule. The National Union for the Total Independence of Angola (UNITA) in the south, the National Front for the Liberation of Angola (FNLA) in the north and the Popular Movement for the Liberation of Angola (MPLA) in the central regions, were locked in heated battles with Portuguese colonial authorities, who were refusing independence for their colony. In 1967, SAAF helicopters were sent in to Angola to assist the Portuguese against UNITA, it was not long before it became apparent that South Africa would become quite involved in this region for many years to come. Between 1966 and 1974, operations were mostly limited to counter-insurgency activities against SWAPO and MK in the northern regions of SWA and the southern regions of Angola, although clandestine operations also took place in various areas of Angola by early members of what would become South Africa’s Special Forces. A military coup in Portugal in 1974 saw the ruling dictatorship overthrown and a new democracy installed. A year later, in November 1975, the new government granted Angola its independence and soon Angola descended into a bloody civil war as the MPLA, FNLA and UNITA all began vying for power. In August the same year, South Africa sent forces into Angola to secure the Ruacana-Calueque hydro-electric scheme, an important project being financed by South Africa that had been captured by UNITA soldiers who were holding the engineers captive. 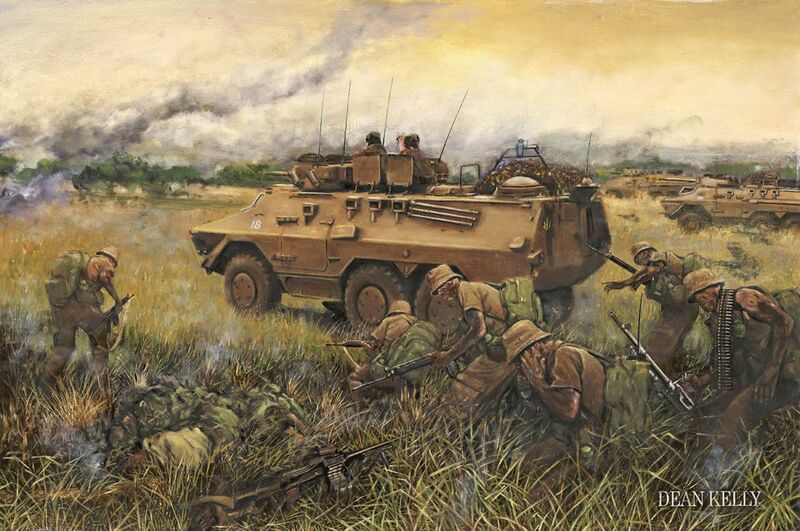 This was the first official military action into Angola and saw an armoured column recapture the pump station and also provided the SADF justification for a permanent protection force inside Angola. 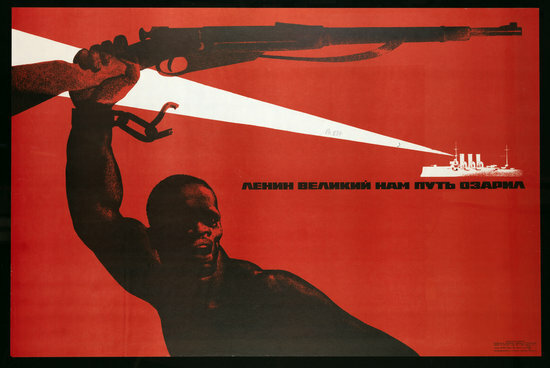 At this point, the MPLA began to ask for outside assistance in combating its foes and it was not long before Cuba, and subsequently the USSR, became interested in helping the emerging nation. The price for their help was the spread of communist doctrine into Angola and the continued presence of Cuba and the USSR in the name of the freedom from the capitalist West and liberation for oppressed black Africans. As this was also the height of the Cold War, the USA became concerned with the communist support base forming in Africa. The Apartheid regime also found it was being backed into a corner, as it was slowly losing its buffer between itself and a hostile black Africa which could easily house the militant liberation movements already baying at their doorstep. The Apartheid regime soon found itself in bed with the USA’s CIA in an attempt to prevent the “Red Danger” (Communism) from gaining a foothold in Africa, and also with the intention of preventing the Swart Gevaar (Afrikaans for Black Danger/Threat – referring to security threat of militant black Africans to the white governments) from reaching South Africa, by putting into power friendly or neutral parties. As South Africa was still under international pressure, embargoes and boycotts, the support from the US was done in the utmost secret, as they could not be seen to be openly supporting the Apartheid regime. Angola was set to become another proxy war in the overall snafu that was the Cold War. Support was immediately given to UNITA and the FNLA to combat the MPLA, who had also begun lending support to SWAPO, although the FNLA eventually became a non-entity in the overall conflict, thus leaving the two sides neatly divided into East and West blocs, with South Africa, the USA and UNITA representing the West, and the MPLA, Cuba, the USSR and SWAPO representing the East. Although this analogy may be simplifying the situation somewhat, many people at the time felt that this was indeed the case. The conflict continued for well over ten years, until 1988, when UN Resolution 435 was implemented, ten years after it was originally written up, granting Namibia independence and enforcing the withdrawal of South African troops from Namibia and Angola. Angola would continue it’s bloody civil war until 2002 with an MPLA victory already present in 1992 but a continuation of hostilities by other rebel parties only ending a decade later. The NP was the pre-eminent Afrikaans/Boer political party of 20th century South Africa, eventually morphing into the pre-eminent party for white South Africans, and remained in power until the free elections of 1994 that saw the ANC elected to power for the first time. Alker, H. Gurr, T. Rupesinghe, K. (eds) (2001) Journeys through conflict: narratives and lessons. Rowman & Littlefield. Baines, G. (2008) “Blame, Shame or Reaffirmation? White Conscripts Reassess the Meaning of the “Border War” in Post-Apartheid South Africa.‟, InterCulture 5.3. Escandon, J. (2009) Bush War: The Use of Surrogates in Southern Africa (1975-1989). School of Advanced Military Studies. George, E. (2005) The Cuban Intervention In Angola, 1965-1991: From Che Guevara To Cuito Cuanavale. Routledge. Morillo, S., Pavkovic, M. (2006) What is military history? Polity Press. Steenkamp, W. (1989) South Africa’s Border War – 1966-1989. Ashanti Publishing.